Used for lab scale and production operations at multiple International Pharma manufacturers, our contained Granulator applications take the idea of retrofits to another level. Here, a broad range of existing and new equipment are supported as a tool to eliminate the risk of contained powder processing. Two methods have been applied. One uses flanges that are added to the piece of process equipment by the original equipment manufacturer (OEM). The second is to totally encapsulate the coater with a pan mounted flexible enclosure. The use of flexible containment allows the end user to process contained when needed and to existing, open processing procedures when containment is not required. In both cases, cost savings are realized by modifying an existing design or using an existing piece of equipment with no modifications. The use of stainless steel flanges added to the granulator enables the containment of the process area. 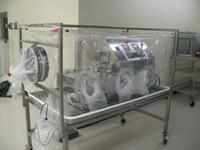 The enclosure is attached to the flange and includes glove sleeves, bungee cords, and HEPA filters. These features support access to the equipment while maximizing ergonomics and support operators from the 5th percentile female to the 95th percentile male. Pan mounted enclosures all the entire piece of process equipment to be contained. This is beneficial for equipment that can not be modified to use the flange mounted approach. Again, the enclosure is supported by bungee cords, attached to the pan, and includes glove sleeves for access to the equipment. The enclosure "moves" with the operator, as is the case with all of our flexible enclosure systems, to maximize ergonomics as noted above.